US agencies to manage Indian tribes were created as early as 1796 with these agencies becoming permanently established by 1800. The Creek Agency, run by Benjamin Hawkins, in the eastern part of the United States was located principally east of the Flint River near Knoxville, Georgia. 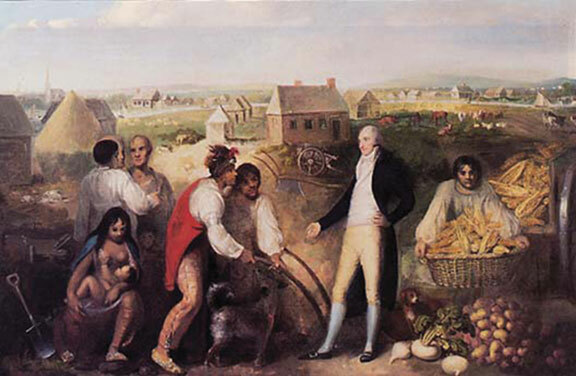 In 1796 Benjamin Hawkins was also appointed by George Washington to the office of General Superintendent of Indian Affairs dealing with all the tribes south of the Ohio River and east of the Mississippi River. Hawkins responsibilities included teaching agricultural practices by starting a farm on his property in Georgia. He brought in slaves to help, establishing mills and a trading post. His expert negotiating with the various chiefs under his jurisdiction, resulted in over twenty years of peace visited upon these Georgia lands during his tenure. Under Hawkins tutelage the local Muscogee chiefs acquired slaves and began their own cotton plantations, gristmills and trading posts all along the Federal Road by 1805. At this time the Shawnee occupied lands in several parts of Ohio. When the “Great Comet of 1811” appeared– Shawnee leader Tecumseh aka “The Prophet,” whose very name means “Shooting Star”– told Muscogee Creeks in Georgia that the star proved that the Great Spirit had sent him to the tribes as a warning to not allow white encroachment onto their lands. Not long after the comet appeared, the New Madrid earthquake occurred in southern Illinois, shaking the entire southeastern continent with aftershocks. Although some contend it was a meteor that crashed in Arkansas rather than an earthquake, to all the tribes of this area the shaking earth meant that something ominous was to come. As the War of 1812 broke out between the US and the British on the Canadian border over a supposed threat to the British supremacy in maritime trading practices, the British sought collaboration with tribes who were fighting to keep their lands from white encroachment. During this time, certain Muscogee factions joined forces with the Shawnee and became known as the “Red Sticks” (sticks painted red were a symbol of war). Between 1813-1814 a Creek War known as the “Red Stick War” began as a civil war with those Muscogee who chose not to join forces with the Shawnee. US Government officials felt this war to be an extension of the War of 1812 because of British intervention. The Red Stick faction joined forces with the British to capture Fort Detroit in Ohio August of 1812. Hawkins learned of this invasion and that in addition a raiding party led by “Little Warrior” had killed two families near Nashville. Hawkins demanded the surrender of those responsible but tribe elders merited out their own punishment, executing those at fault. The elders’ decision ignited a civil war among the Muscogee tribes. Battles raged from mid Georgia to Florida and extended to the American soldiers occupying Fort Mims near Mobile, Alabama killing 300-500 across the Southern frontier. Andrew Jackson entered the fray as battles waged on through 1814 ending with the Treaty of Fort Jackson that required the Creeks to cede their 20 million acres of land and forced them out of Georgia by 1827. Many of those Muscogee who refused to surrender ended up with other remnant tribes in Florida, thus becoming the Seminole Tribe.